MANILA — Typhoon “Paolo” has slightly changed its course by moving towards northeast direction, state weather agency Philippine Atmospheric, Geographical and Astronomical Services Administration (PAGASA) said Friday. In its weather advisory, Paolo was last observed at 850 kilometers east of Basco, Batanes as of noon Friday. 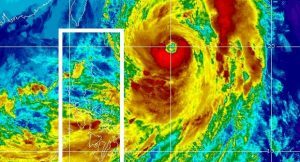 It has maximum sustained winds of up to 130 kph near the center and gustiness of up to 160 kph. Meanwhile, the low pressure area (LPA), spotted 105 kilometers south of San Jose, Occidental Mindoro province and the southwesterly wind flow enhanced by “Paolo” will bring widespread rains and thunderstorm over Visayas, the regions of Mimaropa, and Bicol. “Paolo” is expected to leave the Philippine Area of Responsibility by Sunday (October 22) morning. Metro Manila, the rest of Mindanao, Central Luzon and Calabarzon will also experience cloudy skies with scattered rains and thunderstorms. Coastal waters will be moderate to rough. Residents of the said areas are alerted against possible flashfloods/landslides due to moderate to occasionally heavy rains that soften the ground.